•eDisk™ recovers disk space normally wasted by the Macintosh Hierarchical Filing System by creating precise, custom-sized spaces on the disk for each block of data. 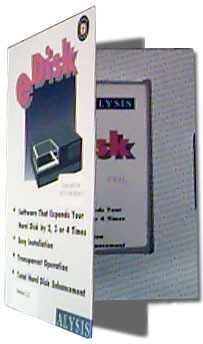 •eDisk™ compresses data as it’s written to disk. For example, a string of "eeeeee" may be compressed to "6e." All data is automatically decompressed by eDisk™ when accessed again. eDisk™ compression operates at the driver level to preserve file structures and eliminate the incompatibilities of file-level compressors. Using these two techniques, eDisk™ can transparently expand the capacity of a hard disk by a factor of up to two times or more.